Designed for data centers and other computer intensive work environments, Kewaunee’s Evolution™ for LANs is an extension of the Evolution™ laboratory furniture workstation product line. 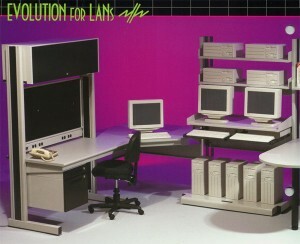 Additional components and accessories that support LAN and other computer-based work functions are located in E4L catalog. These include: peninsulas, fixed and mobile floor shelves, cable management, diagonal ‘sit-at’ corner worksurfaces, NWP series power strips, mobile workstations and more.